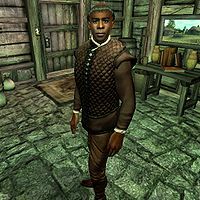 Pranal is a Redguard warrior and the master trainer in Heavy Armor. He can be found at the Roxey Inn, north of the Imperial City. Pranal has a secret crush on the Innkeeper, Malene, but is too shy to tell her his true feelings, and even though Malene has her suspicions, she wants nothing to do with him. He wanders around the Inn all day long, talking to her and the other guests, except when sleeping upstairs between 2am and 9am and eating breakfast downstairs between 10am and midday. He will offer his services at all times, except when sleeping or eating breakfast. He wears a pair of doeskin shoes, tan linens and a quilted doublet. His only possession is a small amount of gold. The two advanced trainers in Heavy Armor, Varnado and Valus Odiil, will point you toward Pranal once you have surpassed their skills. Varnado will point you to the Roxey Inn and will also reveal that Pranal used to be a gladiator: "The only one who can teach you anything more about Heavy Armor is Pranal. A master gladiator back in his day, he was. I think I heard that he'd retired, and was living out his days at the old Roxey Inn here in Cyrodiil. You might try there." Valus will provide you with a similar reference while also praising Pranal's skills as a teacher: "Long ago, I learned much of what I know from a man named Pranal. An excellent teacher, he was. You should consider learning from him. I met him in Hammerfell, but I understand he moved to Cyrodiil a few years back. The Roxey Inn, I think? You should look there for him." If you ask about training again, both trainers will provide you with a simple reminder: "You'll have to find Pranal if you want to learn more. That's all there is to it." After you have received the master training reference from one of the advanced trainers in Heavy Armor, Pranal asks you for a small favor: "Training? Goodness me, I’m retired! I’m afraid combat doesn’t interest me any more. All that matters to me now is Malene. I’m no fool. I know she’d never be interested in an old man like me. It’s enough just to be around her, to be in her company. Well, if you’re dead set on learning something from me, then how about you do a little something for me, first? Something for her, to be honest. I’d like to get her a gift of a sort. Nothing terribly fancy, and something useful... How about a nice silver pitcher, and a set of four glasses. Here’s 50 gold to cover the costs, that should be more than enough. Come see me when you’ve got everything, and we’ll talk more." When you return with the silverware, he asks you for yet another favor: "Ah, these look lovely. I’m sure she’ll like them. You just go give them to her. No need to let her know where they came from; it doesn’t matter. So long as she’s happy. Just give them to her; say they’re from a friend. She doesn’t need to know I’m the one responsible." At long last, he will offer you master training with the words: "Ah, wonderful! I’m sure they’ll make her happy. It’s the least I can do; she’s brought so much joy into my life, whether she knows it or not. Thank you for indulging an old man’s whims. Now, you wanted to learn something about Heavy Armor, didn’t you? I think I can help." As Pranal already admitted, Malene probably doesn't have the same feelings for him, and she will admit just that when you hand over the gift; "A gift, for me? Oh, my. This is from Pranal, isn't it? He's such a sweet man. I do enjoy his company, but I'm afraid I just don't have romantic feelings for him. Well, these are simply beautiful. Thank you so much. And there's no need to let him know that I know where they came from. You understand." Esta página foi modificada pela última vez à(s) 20h18min de 6 de janeiro de 2015.